who needs lawn when you can have THIS? I have never had a lawn, actually. When my husband and I first moved into our home, I knew nothing about gardening – but I DID know that I didn’t want a lawn. why lawn when you can have more of THIS? To be honest, it wasn’t for any of the high-minded ideals that I espouse these days. I just found turfgrass extremely dull. Snore. Snooze. A big blanket of green, and that’s about it. I wanted something different. something dramatic – so my very first garden was a field of double black thundercloud Papaver somniferum. I wanted it to be a goth version of the poppy field in the Wizard of Oz. I loved it! Then I realized that I was basically growing opium in massive quantities in my front yard and I got really paranoid whenever the neighborhood cops drove by. I pulled them out and thought about a new front yard design, but putting in lawn never even entered my mind. I am an iconoclast by nature. I tend to go against the grain. 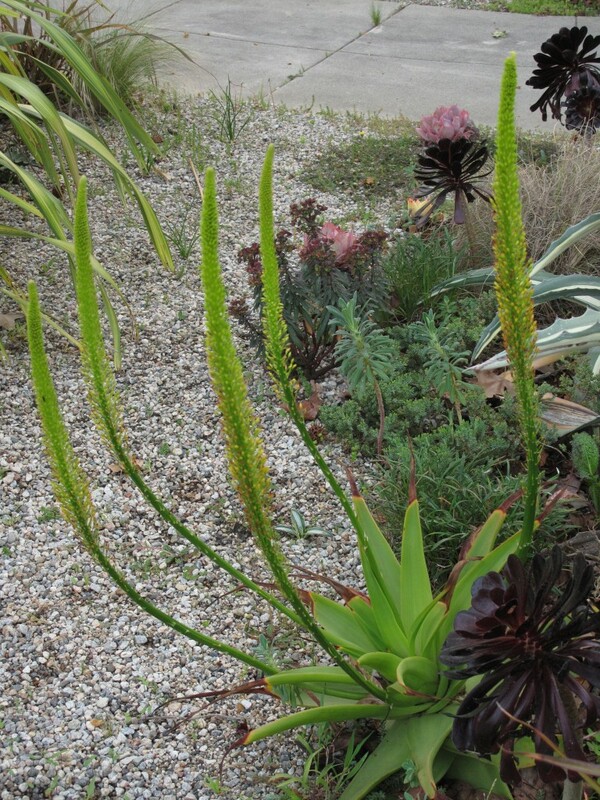 I love to explore alternatives, and so when I began thinking about what I could do to my front yard, I was attracted to the strong, sculptural shapes of succulents softened by grasses and other drought tolerant perennials. It is a front yard that evolved over time into a dramatic space that uses very little water, has edibles integrated into the design vignettes, and has, in fact, turned into a neighborhood landmark. gravel is my favorite substitute for areas that need foot traffic. Who needs LAWN? So with that in my front yard, why have lawn anywhere on my property? I thought about it, and realized that I didn’t need or want it. Living in Southern California, drought is a constant threat. Watering lawn is expensive and ultimately wasteful. 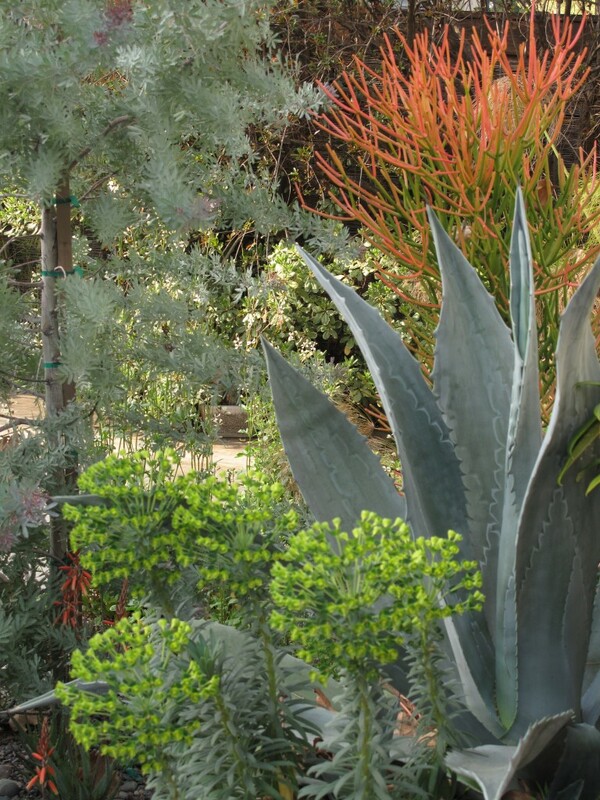 My succulent, drought tolerant borders in both my front and back yards get water once a week in the heat of the summer, and that little bit keeps them looking great. Thirsty lawn is often the lush carpet of green that “sets off” complicated plantings, but in my garden I use gravel as a negative space that also handles foot traffic. The look is neat, clean, and can be either modern or rustic depending on how it is deployed within a design. I have a large concrete patio that serves as a platform for my container gardens, and is used as the main gathering space whenever we throw parties. My raised edible beds are productive and handsome – they give me food to supplement my marketing as well as a tremendous amount of pleasure in planning, planting, and harvesting seasonal crops. So with all of this – why would I need lawn? When clients ask for lawn, they always say they need a place for the kids to play. I know several children who have grown up in lawn-free environments – they play in the trees, make forts under large shrubs, create little imaginary worlds among the plants and flowers. It seems to be a much richer experience than whatever game they could play on a backyard lawn. with all this raucous fun, all of this cool jumble of WOW, who needs LAWN? There is a place for lawn, in my opinion – city parks, museums, public squares – places where people can gather, picnic, play frisbee and other lawn games in a social setting. Maybe small patches of lawn in yards in climates where there is ample water, with wild meadows and gardens filling in the majority of the planted space. 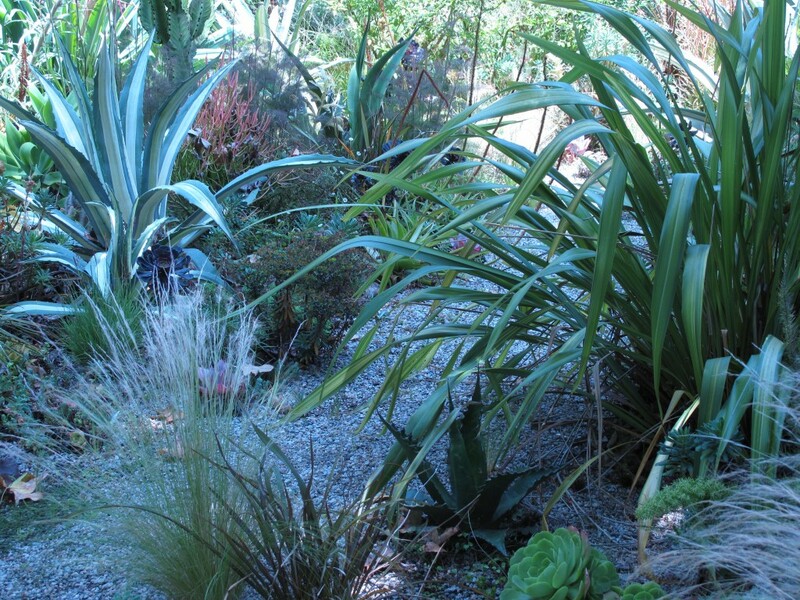 But in urban or suburban environments in dry, hot zones, our need for lawn must be re-thought. There is an alternative … creativity, boldness, and commitment to an ideal that is more responsible, more sustainable, and way way cooler. Re-think your need for lawn. There are other ways. Now please follow the links around the country and see what my esteemed colleagues have to say! This month we have the members of the Lawn Reform Coalition weighing in, and they KNOW from lawn alternatives! There are ALOT of great posts and amazing ideas in this group, so don’t be shy! Jump on in and get all juiced up to tear out some LAWN!!! Germi, I love your gorgeous pictures, and you have inspiring words as well! I have lawn, because I live in a suburban area with a decent amount of room (and ample natural rainfall), and landscaping can be expensive to do all at once. So I’m taking the tack of removing just a bit at a time, and caring for my lawn organically and with low water. I love the idea of a goth poppyfield, by the way! 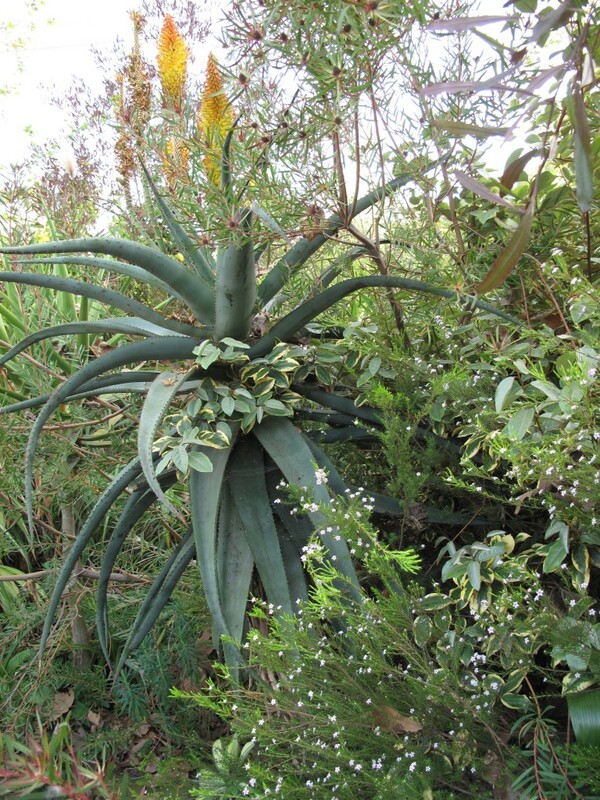 Drooling over your photos, this Minnesotan gal is nursing a whopping case of succulent envy. What fun! The kid in me responds with glee, remembering how much of the best play involves hiding and exploring. Yes there is so much more out there for all of us, and thanks for the visual and verbal whip-cracking. Oh kindred spirit ! Why waste space on lawn when there are so many other ways to express yourself. I think succulents are a great solution for California gardeners. I am trying to get enough common thyme and other groundcovers like barren strawberry to cut down and eliminate mowing. My husband is all encouragment in this project. Loved your comment/tip that your gravel walkways fulfill the need for negative space in the design. The light gray color you’ve chosen is a nice contrast to all of your spectacular greenery, and easy to see in low light situations, too. Brava! Gravel is a wonderful way to set off complicated planting schemes and I’m so glad you brought that up as a lawn alternative. And I can’t get enough of your succulents, either. Some day I’ll visit and wander around looking at all the ‘old friends’ I’ve come to know through your blog. sigh….. Your post was my husband’s favorite. Ivette, you capture my soul! I was two minutes into our house when I started digging up grass. That’s hilarious about the poppies. I visited an Austin garden one time where they were all dug up mysteriously in the night: hard to say if it was druggies or fearful folks. Nevertheless, more interaction than in a lawn!! Evelyn – HI! I am such a succulent crazed fool I can barely post about anything else – even when posting about edibles, succulents are snuck in SOMEHOW! Jocelyn! Yes, gravel is my go-to substrate for pathways and patios. Tough, inexpensive, permeable … what’s not to like? And it comes in so many colors, polished, unpolished – I LOVE GRAVEL! In fact, I think that will be my next book proposal. GRAVEL. Sweet One!!! I can’t wait until I can host you in my garden the way you host so many of us in YOURS! XOXO!!! Hi Linda! Omigod my poppy fiasco was short-lived, glorious, and crazy! I got so paranoid! And we did have some people circling the house every now and again, eyeing the poppies – and in MY shady neighborhood, you never know. But the only odd thing we noticed was birds pecking at the ripe pods. Stoner birds!!! Your garden is always exciting to see again, Germi. Like you, I immediately ripped out my front lawn at my former home, before I’d even unpacked all the boxes in the house! It’s taking a little longer at my new-ish house, but the back lawn is gone at least. A garden is so much more interesting! I think lawns in backyards have a place and can serve an important purpose in uniting a neighborhood. Here in my neighborhood in CT, we are not within walking distance to a neighborhood park. In fact, the closest one is probably about 10 mins. away by car. Our garden, and most importantly our lawn, was ‘the’ place to play in the neighborhood when my sons were young. We also have the trees to climb and the shrubs to hide under but ti was the lawn that was the draw. Not only did that play area bring the kids together, it also brought the adults together. The connection the kids made playing together extended beyond them. But, I have to admit, that as my kids have grown and the lawn is not used for games as much anymore, we have slowly shrunk its size. But I don’t regret having too much lawn at one point and I think every neighborhood deserves a central play spot, even if it is in someone’s back yard. Pam – totally! And I LOVE your backyard! Talk about interesting … XOXO!!! Shirley – I will testify til my last breath! Debbie – I understand what you are saying – playing organized sports on a lawn is as American as … as … as all those things that are so American! And a big lawn in someone’s home can be a galvanizing meeting place for the neighborhood kids, of course. BUT – you say you were the only place with the flat piece of lawn for kids to play on, and that was the local ball field. That is great that you provided that – in effect, YOU were the neighborhood park. So what did the other yards in the neighborhood look like? Since they were sloped, or small, or lacked the je ne sais quoi for organized sports, did those yards explore alternatives or did they stick with the default of lawn? Did the kids also have alternative spaces to play in that involved a different type of outdoor experience – could they build the treehouses, wander through woods, plant their first edibles, or make those little fairy houses? A rich, expansive garden is a world unto itself, and asks different things of us. For healthy, robust children, those days playing soccer in the fresh air on the best, biggest lawn around is essential. But in these days when the inner lives of our children our disappearing in the wake of video games and the constant assault of the computer and other digital distractions, those magical garden spaces that invite the mind to wander and create worlds within worlds are more valuable than ever. The alternative to a lawn is an important alternative. I am not saying that ALL lawn has to go – I’m just a big advocate of variety, of choice, of thought, and of not going with a default. The more people realize that there IS another way, another option, the better for horticultural diversity! Thank you for the thoughtful comment, Debbie! Yes, we still use gravel here, but it is seen as old hat now. However who cares? You are so right in what you say! Wow that’s amazing! How long did it take for you to make it so beautiful? I hate lawns…Zzzz…Thank goodness the severe drought in Austin this year may make a lot of people consider more creative, less water guzzling alternatives. Most lawns are now dead straw in this city. Lawns…sounds a lot like yawns.